As a reviewer, I tend to shy away from games that I don’t find all that interesting. Ever notice how many card games I’ve reviewed on this site? Kind of slim eh? Yeh, I don’t like digital card games. I love Blizzard, but I haven’t touched Hearthstone. I love The Witcher, but I won’t go near The Witcher Adventure Game (even though it’s mostly a board game). I’ll play them in person, but digital just doesn’t click for me. Why would I touch Race for the Galaxy then? Well a good friend of mine asked me to take a look. Does Race for the Galaxy justify my disdain for the digital card game concept or did it birth a new genre for me to embrace and enjoy? Let me break it down for you. 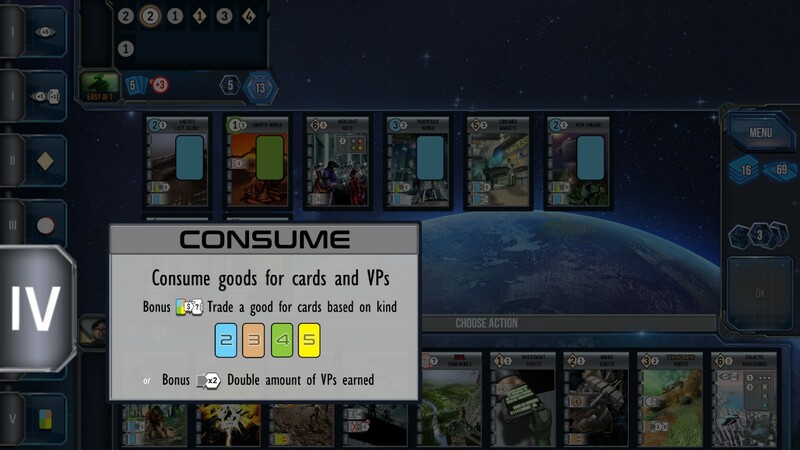 After you produce “goods” on cards (those colored squares) you can choose to trade them in for more cards or victory points. If you don’t plan ahead, someone could make you use them and you won’t get the full benefit. Be mindful! Let’s start with the basic issue I had with the game. Have you ever played a card game with a lot of rules and strategies before? Are you one of those people who had a fair bit of trouble wrapping your mind around it and had to ask a few questions of your friends? I have. There in part lies one of my biggest issues with Race for the Galaxy (RFTG from here on out): it’s complicated. Now, I’m all for a challenge, but the difference here is that all you’ve got are the provided tutorials. They do an OK job of laying down some of the basics of how the game can be played in three different ways. None of them are purely one way or the other because the games cards are not commonly given out when you need them as is the case in real life. Sometimes luck is with you and other times you just can’t draw the right card to save your life. Given that, and there are a lot of details that aren’t fully explained in the tutorials and you’re left up to pick up the rest yourself since it’s digital and unless you or a bud has played the card game before, this may be tough. It’s not impossible, but it’s tough. There is also no in-game chat which some people have complained about. However, I don’t think I really want to hear about the many ways someone close to me has been violated over the internet so I’m OK with that. I tend to only really want to play games with my friends anyway. How many other chat programs are out there? Skype? Raidcall? Blizzard and Steam have a chat function. Discord even? Pick one and you’ll be set. Some people do want to talk to the rando’s and that’s fine, but that’s not me. I’ll take the atmospheric music over some drivel any day. There are many things to pay attention to here. This card only benefits Genes worlds (green planets) while other cards work for all. The “+2 Military” could help you start taking over worlds beyond the scope of your current military. 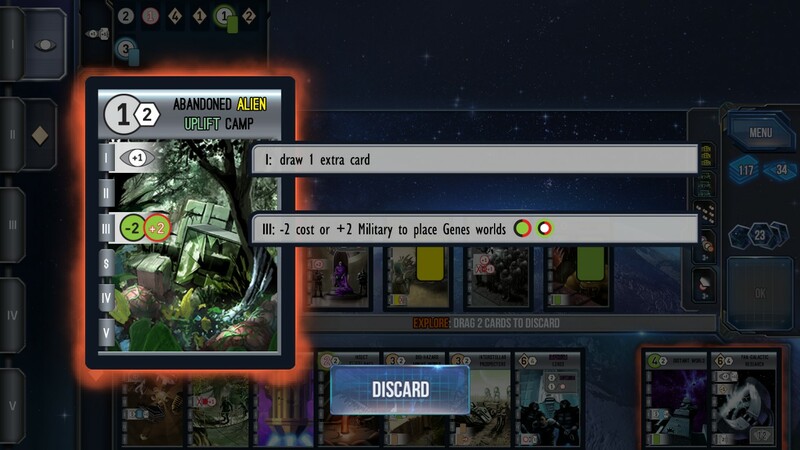 That means more victory points faster if you have a Genes military world show up and not a card that will up your military in time. I’ve held onto cards a whole game hoping to use them and have it not pan out. On the same note of not being able to talk to your opponents with some in-game tool in RFTG, finding a match can be kind of difficult as well. Not impossible, but I’ve been told that you need to manually refresh the online search. This isn’t really a problem either. To note, whenever I go on, there is usually someone looking to play a game even if I’m not willing to play with them. I’ll shoot random people in Overwatch, but I don’t want to play card games with random people over the internet. Again, that’s just a thing for me. There are two expansions to play with alongside the vanilla game. It’s easy enough to select which ones you want to play with, but if you’re having trouble learning the game, don’t play with any of the expansions (except the first) because they compound the difficulty that’s already there. The basic mode has three main ways of winning. You can mass a military and take over worlds to get victory points. 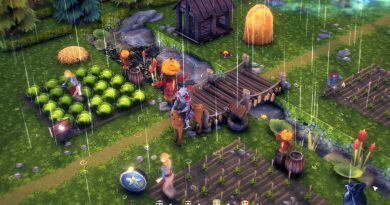 You can gather worlds that produce goods and then trade them for victory points. Then there is production and that comes off to me as gathering specific cards that require other cards that gives multiple victory points depending on how many requirements you’ve met on specific cards. There is, of course, the possibility of playing a mix of these three to win as well. The expansion Gathering Storm adds some side conditions to earning extra victory points as well as adding additional cards. 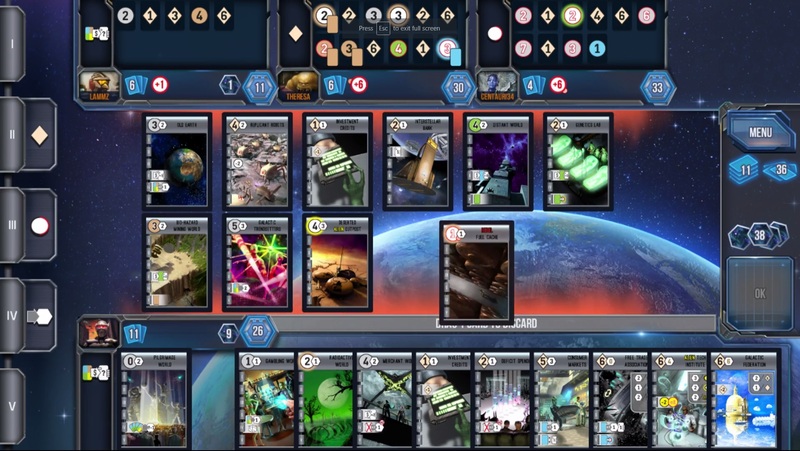 Rebel Vs. Imperium adds the ability to actually attack other players cards and take over planets. That’s pretty cool and adds a bit of variety for not too much cost (about $3.99 I believe). In all honesty though, I like the basic card game with the NW (the one I mentioned at the top of this paragraph) expansion and I’ve no idea what that stands for, but there’s more cards for more vanilla action and that’s cool. Four-player mode with friends that you are chatting with is where it is at. This is where I had the most fun with RFTG. With all that, RFTG was a super frustrating experience at first. I got to play with Theresa “The Reza” Duringer one of the devs on a Skype’d game where she screen-hacked her way to victory (sarcasm) all in the attempt to teach me how to play. After that, we took it public and on-line in our latest episode of 2 Newbs and a Game where we did a 1v1v1v1 and she straight rocked us all, every time. However, I had a lot of fun. That’s one of the huge stipulations to RFTG for me. If you’ve got buds that will chat with you somehow while playing, RFTG can be a boat-load of fun. If you don’t have any promising leads on buds that will play with you, then I’d say to either get some, be able to play solo (which is actually pretty cool), or be competitive and have fun going online beating rando’s. I was not having much fun with RFTG until I learned the ropes and when my co-op buddy joined me. Having my wife play as well and adding Theresa in the mix only sweetened the pot. Overall, I was happily impressed with my time with Race for the Galaxy. Had I not had someone there to hold my hand and explain things to me, I probably would have written it off. However, I’ve got friends who play this and we talk via Blizzard chat and we have a fun time. It’s fairly fun by myself as well now, but it’s still a card game and RNG can really suppress a plan that you could be concocting and that can be very frustrating if you’re not willing to switch it up and pick a new tactic. I tend to be stubborn soooo… yeh. There’s a lot of strategy to be had here and you’ll have to keep an eye on your opponents cards so you don’t end up helping them. Race for the Galaxy is fun and I do turn it on frequently to get a game in or two against the medium ai, but the lack of real-life interaction between friends keeps this game from being first-rate. I’m not entirely sure that comes off as fair to judge a videogame like that, but I rate for fun and my card-based fun is more fully enjoyed in real life.